This unique alternative to trek to Machu Picchu was hand selected by our Adventure Travel specialists to share with you! This trekking journey by one of our preferred companies on the ground in Peru is not only authentic in nature but carefully cultivated down to the details! 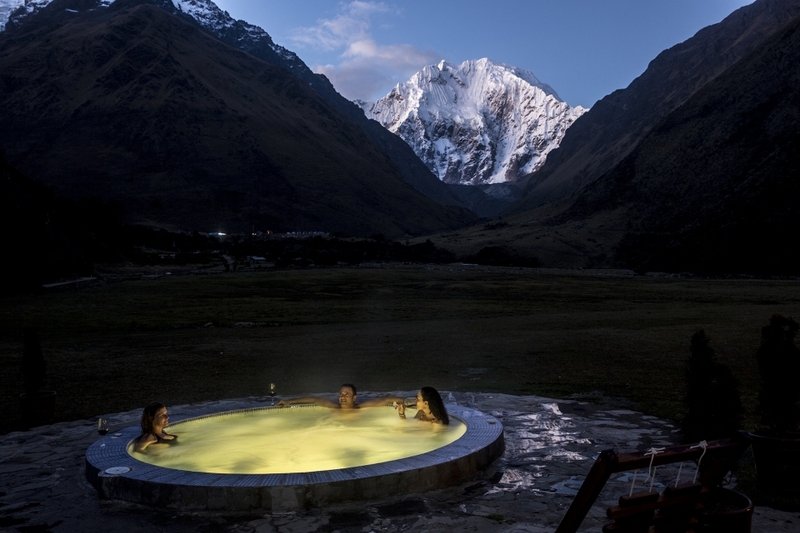 This 7-day lodge to lodge trekking experience will take you on a historic section of Inca trail through 15 different eco-systems, while you traverse a mountain pass over 15,000 feet, explore villages where locals still maintain age-old traditions and re-discover the mystical beauty of Machu Picchu, the crown jewel of the Inca Empire. 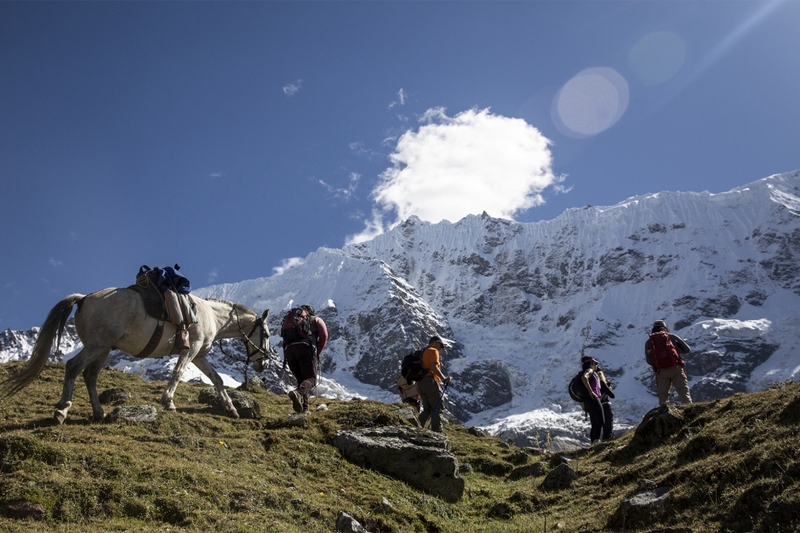 The Salkantay experience goes beyond deluxe lodges and a great trek. It is a unique opportunity to experience ancient history in the Land of the Incas, as well as the most interesting and exotic variety of flora and fauna, all in the company of new friends and like-minded souls. After an early breakfast, your tour guide and driver will pick you up at your hotel in Cusco. The first stop will be a visit to the Inca ruins of Tarawasi. Next, you will stop in the mountain village of Mollepata. There you will visit El Pedregal, a beautiful farmhouse where you can learn about local agriculture and livestock. Then, the transfer will take you through a winding mountain road to a site called Challacancha. Here you will begin your hike to Soraypampa along a picturesque path called the “Camino Real” (Royal Path), which is also a good opportunity to acclimate to the higher altitude. 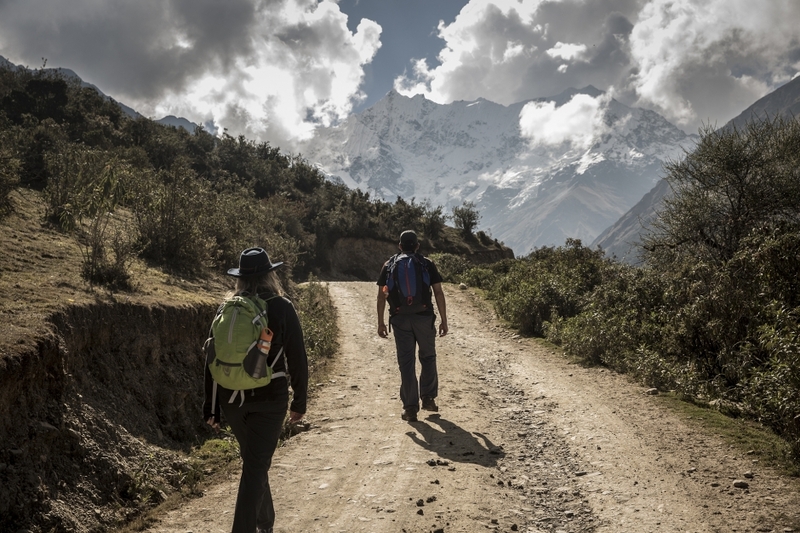 As you round the final turn of the Camino Real, the Salkantay Lodge will come into view. Day two presents another opportunity to gauge your altitude-acclimatization with a half-day hike to Lake Humantay. After breakfast, you begin an ascent up the slopes that border the plateau behind the Salkantay Lodge. An hour and a half later, you will be stunned to see the turquoise water of the lake. Here you will have a chance to relax, enjoy a snack, meditate in the tranquility of this magical spot and be part of a traditional offering to “Pachamama” (Mother Earth). After your descent back to the lodge, the staff will be waiting with a hot lunch. The second half of your day is spent at leisure. You may opt to soak in our outdoor jacuzzi, indulge in a relaxing massage or even take a long nap. After a leisurely breakfast at the Wayra Lodge, you continue the descent along the banks of the Salkantay River through increasingly verdant scenery. Today you will see more of the local people as the trail takes you past their simple homes and makeshift fences. At lunch time you will arrive at Colpa Lodge, located on a high promontory at the confluence of three rivers. You are greeted by the staff with a Pachamanca lunch, a traditional Peruvian meal cooked in the earth by hot stones that create a natural underground oven. After lunch, spend the afternoon lounging in the sun or relaxing in the outdoor jacuzzi while you take in the panoramic views of the lush green mountains that surround you. During a 2-3 hour climb up a path mostly comprised of original Inca steps, you will get a sense of what hiking through the rainforest would be like. Your first milestone today will be the top of the peak, the last one before you reach the Aobamaba River valley that connects you to Machu Picchu. When you arrive at the ruins of Llactapata at the Llactapata Pass (2,736 m/8,974 ft), you will be delighted to see a southeast view of the “back” of the Machu Picchu ruins. Enjoy your lunch a bit farther down the trail in a meadow with panoramic views. The final descent takes you through lush bamboo forests, until you end the day’s hike at the Hidroelectrica train station. A one-hour scenic train ride delivers you to your final stop, the town of Aguas Calientes at the base of Machu Picchu. At dawn, you begin your journey to Machu Picchu with a short and rollicking uphill bus ride. Prepare to be awed by the imposing and skillful architecture of the Watchtower, the Temple of the Sun, and the royal Inca residences, among many others. Your imagination will soar as you contemplate the history of Machu Picchu and its mysterious origins. Some may even choose a hike to Huayna Picchu, the iconic towering mountain often seen in photographs. After the visit you will have lunch in Aguas Calientes before your train/ transfer back to Cusco. As night falls and you arrive at your hotel amidst and hustle and bustle of Cusco, you will be touched by a feeling of peace and rejuvenation which will linger even as you journey back home. Mountain lodges have brought together traditional Inca building techniques and sensitivity to the surrounding environment with all the comforts of home. 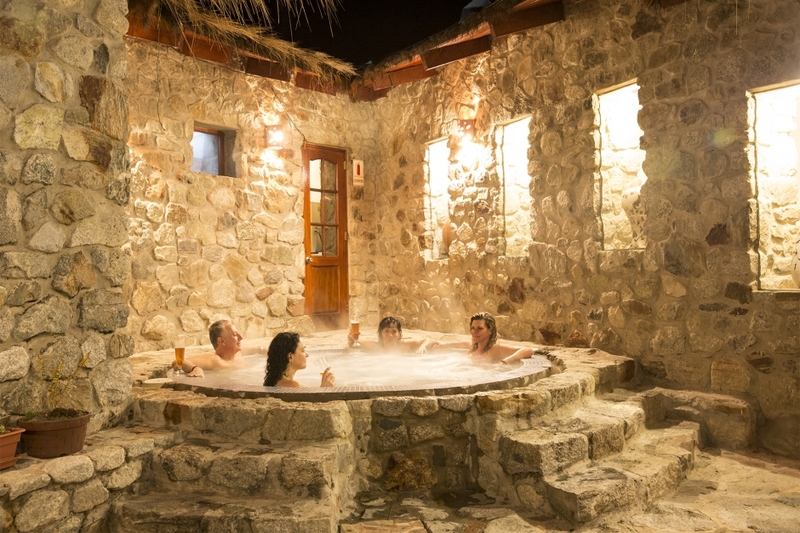 At the end of each day, you will enjoy hot showers, fine gourmet meals, select wines, goose-down bedding, massages, outdoor jacuzzis and highly personalized service from local staff. The guides are among the best in Peru (some even having won international awards) and have on average at least 15 years of experience guiding in the mountains, not only in Peru, but around the world. Many of them are considered pioneers in this area, having scouted many of the current routes in the country. You will appreciate their knowledge of history and cultural traditions, as well as their interpretation of local flora and fauna, and their great insights (and stories!) that go far beyond any guide or history book. There are countless reasons to travel to Peru, but the country’s magnificently beautiful natural landscape is definitely the huge draw to this stunning area of the world. This is just one of many itineraries and customized trips we can assist with! Contact one of our Adventure Travel Specialists today to start planning your South American adventure! 604-736-7447 or select the ‘contact us’ button! Bonus fun fact: Peru is bordered by Ecuador, Colombia, Bolivia, and Chile – making it easy to arrange day trips or a couple days away to surrounding South American countries!